Programmers might be more comfortable with an analogy with a stack and Last-In, First-Out (LIFO) order of completion. All the stories, except the innermost story, are interrupted at a crucial point in the story to start the next story and they then resume in the reverse order in the second half of the book. All the stories are narrated by someone - as diary-entries, as letters, as a manuscript, as a testimony, orally, etc. - and they observe the immediate outer story by reading it, watching it, etc. Either the main character or an important supporting character in a given story is a reincarnation of someone from the outer story, indicated by a special birthmark or by episodes of deja vu. The stories are narrated in the form of English that might plausibly be used by the characters of that time, with stories set in the future employing imagined variants. For example, the story set in a near future uses a language full of genericized trademarks (e.g. “fords” for “cars”, “nikes” for “shoes”, etc.). This sometimes creates problems in reading them though - the story set in the 19th century had me reaching for the dictionary many a time and that set in a post-apocalyptic future was very difficult to read due to the numerous contractions and substitute-words. In one of the stories, several dialogs by one of the characters are in French, without the book providing any translation for them. All the stories are interesting by themselves, but beyond the thread of reincarnation, there is not that much intertwining them, nor is the book as a whole as groundbreaking as it would seem from the reception it got. The book did make much more sense to me than the eponymous film though. 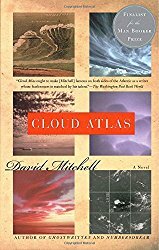 I still do not know why it was titled “Cloud Atlas”. In short, I did not understand the brouhaha about the book and the film. Perhaps I missed something here that was obvious to the others. Perhaps it was a triumph of a marketing machine. Whatever.